Hemanth Kumar Biswas from Bangaon, B.E. - B.Tech Graduate. PROJECT MANAGEMENT .. GOOD COMM. SKILLS HI.. ADAPTABILITY & GOOD .. FAST LEARNING CAPABI.. PROCESS IMPROVEMENT .. MAN POWER HANDLING &.. WORK EFFECTIVELY UND..
are one of expert skill area's of Hemanth Kumar Biswas . 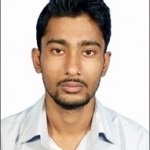 Hemanth Kumar Biswas is working in IT Software industry.